If I were to journal about my life, I would, as the cutest dachshund ever, write about how I start each day cuddling with my BFF Shelley and then when she starts getting up, I zoom under the bed. That’s because I don’t want her to take me on my morning walk. It doesn’t matter that I have to go potty. The point is I don’t want to leave my warm bubble of sleepy time, especially now with temperatures at 0 degrees. Plus, when it rains or snows, like it is now, I don’t want to get my paws wet. For some reason and nearly every day, Shelley lures me out from under with treats that she puts in a three-part path that gets me every time, though I tell myself, “Stay.” I don’t, letting my hunger overcome my desire for comfort. So, here’s what happens: I eat the treats and feel a hand come under my belly. I’m placed on the counter. My harness is put on and the leash snapped in place. I’m taken down the hall to the elevator and placed on the elevator floor. At the ground floor and outside, I walk two steps to a planter bed, go potty and run back to the door. I am done. I want to go back upstairs to warm, coziness. And that’s just my morning. Shelley goes to work, and I just hang out, sleeping and barking at noises. When Shelley comes home, she walks me again and takes me somewhere where people love on me, and then we go to bed. It’s a good life, even if the morning routine I’m subjected to is not how I want to start my day. I’m really proud of my BFF Shelley. She got her blog published Oct. 24 as a guest blog on mystery writer Patricia Stoltey’s blog, patriciastoltey.blogspot.com. I give her two barks and a high paw five. 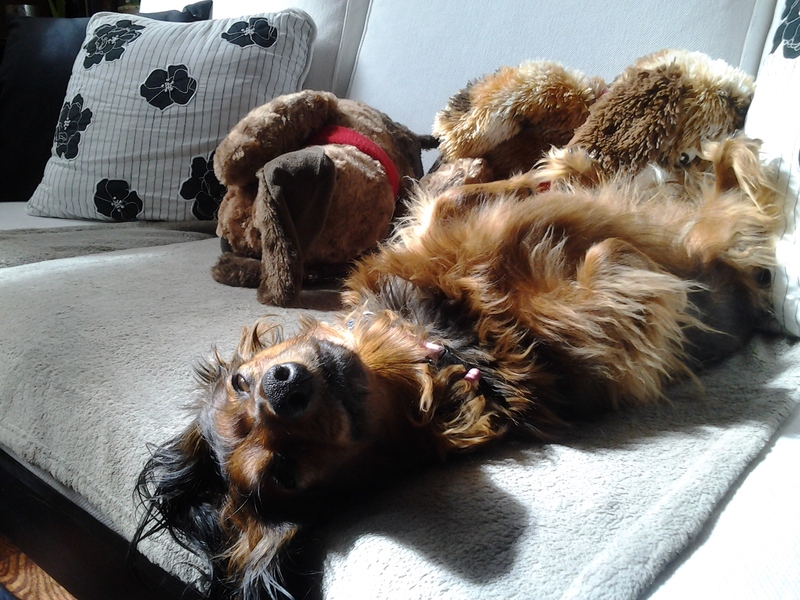 Next week, it’s back to me and being a very darn cute dachshund. Unlike my BFF Shelley, I do not procrastinate. I post my blog every Sunday about interesting things having to do with dogs, caring for dogs, understanding and communicating with dogs, and paying attention to a particular dog. I am that particular dog. 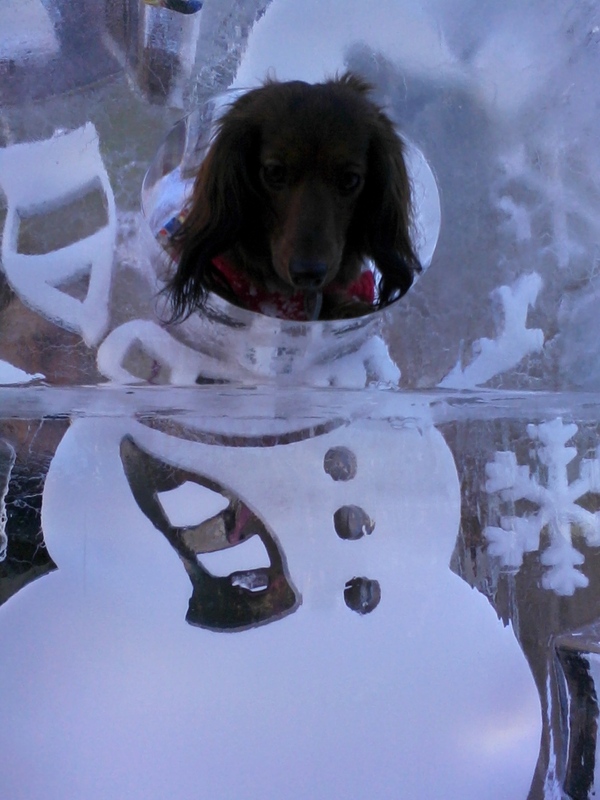 My name is Zoey, and I am the cutest dachshund in the world. I have been told that I am cute, beautiful and pretty. I get stopped all the time for petting sessions, photographs and conversations about my high level of cuteness. And I meet all kinds of people, though I don’t do so well with other dogs (especially if they are big). Given all this, I should be telling my story. 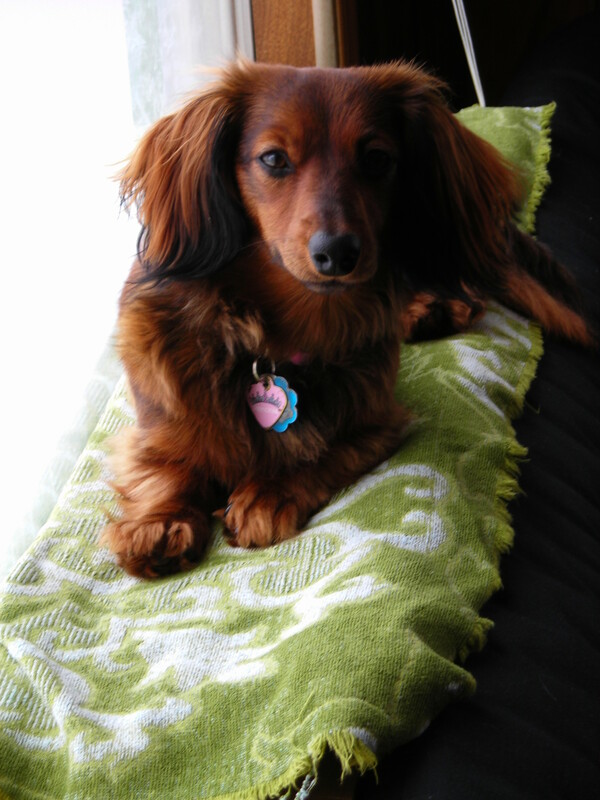 I call my story, or blog, “Zoey’s Paw,” because I have my paw on all things worldly, as well as use my paws to write. 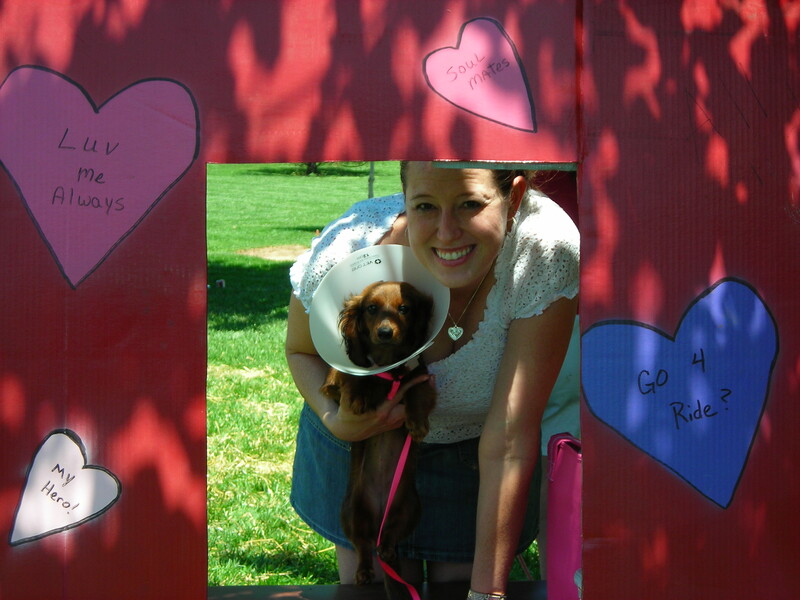 During my first year of blogging in 2009, I told the story of how my BFF and I met in a pet store. I was a wee nine weeks old and weighed 2.8 pounds (I now weigh 10). My BFF asked to hold me, and I leaned my head against her chest, causing her to be a goner. Can you blame her? I was so adorable back then (and now) with two-inch whiskers, large melty-brown eyes and a black stripe down my back (that has since disappeared). Shelley left me at the store and returned with her mom the next day, and I did the same lean-my-head-on-the-mom’s-chest thing. I got to ride home in a big car, see the big world and enter my new home. “She acts like this is her home,” the mom said as I pranced around on the carpet, sniffing out my future place of residence. Shelley took me to puppy kindergarten and intermediate training; she read books about dogs and my particular breed; and she worked hard at my training. What did I do in return? I loved and love Shelley unconditionally (well, except during bath time), and I draw attention to her by drawing attention to me. Lots of people know my name before they know hers – even so, I get her to talk more and be more social. I’ve been good for her, as she has been for me. It’s called puppy love but not just that; it’s forming a partnership and a friendship, plus a boundless, energetic BFF. 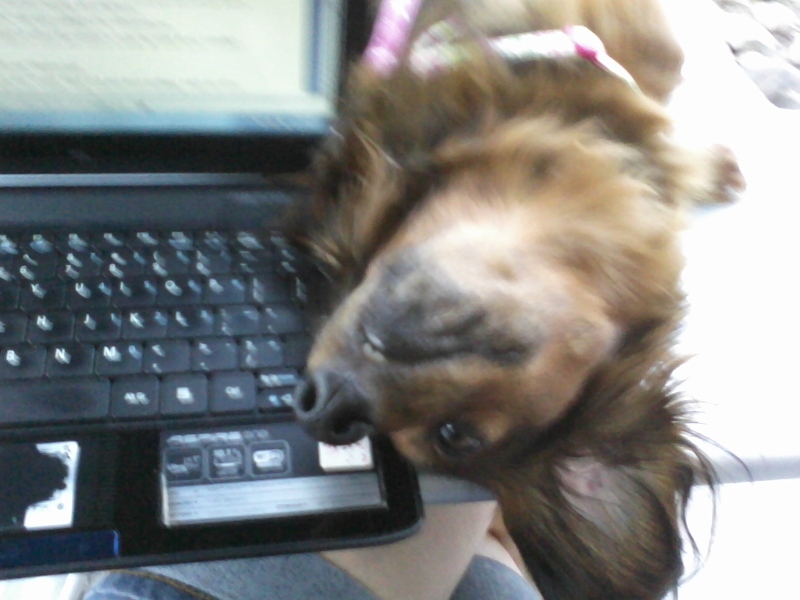 Zoey the Lapdog is hard at work blogging on her borrowed laptop. I’ve got my paw on the secrets of blogging. 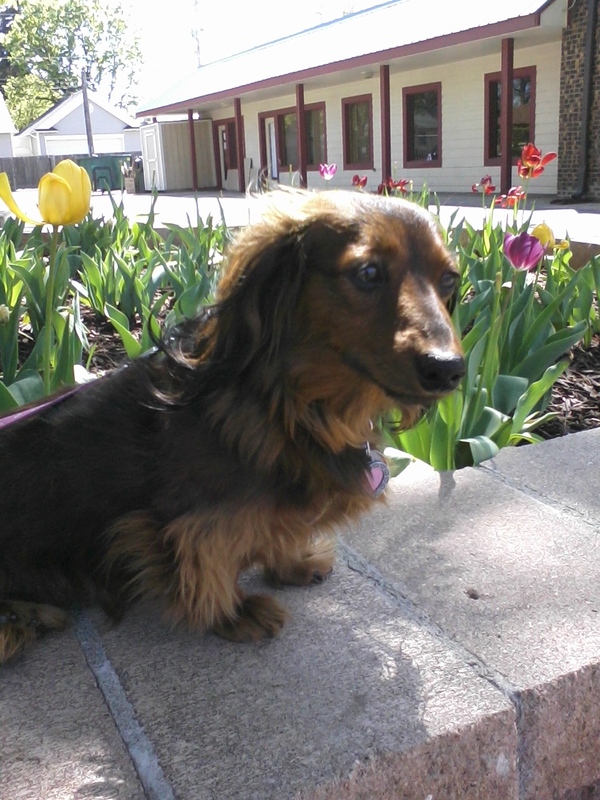 My name is Zoey, and as the CEO of Cuteness, I write as “Zoey’s Paw.” I am a cute, darling and pretty miniature long-haired dachshund with a big personality in life and on the page. I started blogging in June 2008 as a co-blogger with my BFF Shelley, who writes as “Shell’s Ink.” She writes about the process of writing and the writer’s life, while I write about the dog’s life, anything from why I like and deserve treats to why dogs need attention, playtime, exercise and walks. My blogs are based on research from books about dogs and some online stuff, too, plus personal experience. This, I believe, makes them interesting and insightful, while also providing material on dog behavior, personality and survival needs, plus plushy but just as necessary wants. • I learn new stuff, like what my different barks communicate to humans. • I’m a better researcher, which adds to my skills of digging and smelling while running around outside or taking leash walks. I can better understand and put into words what I’m experiencing instead of just experiencing it; i.e. I’m smarter. • I connect with other humans who love dogs and the few canines out there who do blog (we’re an elite bunch). • I’m a better writer, because practice makes perfect. And last but not least, I get to see my photos all over the web, plus expand my fan club so they can admire me and see just how cute I am. After all, I am the CEO of Cuteness.